Entrust, Inc. is addressing the importance of emerging solutions that help address critical border security challenges and defend against advanced malware attacks at the first global conference co-hosted by INTERPOL and the Hong Kong Police. The inaugural event, to be held through Sept. 17, will outline the solutions required to properly secure border checkpoints, as well as what changes need to be made to protect financial institutions from malicious man-in-the-browser malware. Entrust director of product management Mark Joynes will present on behalf of Entrust. Joynes’ presentation, “Strong Identity as the Foundation of Critical Infrastructure Protection,” will center on strength of identity and the need for identity-based security for preparedness, detection and response to cyber- and critical-infrastructure protection. 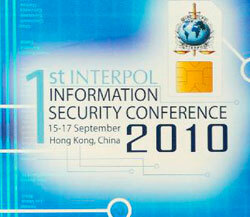 The INTERPOL Information Security Conference (IISC) 2010 brings together industry leaders, academic experts and law enforcement representatives from 188 INTERPOL member countries. The conference aims to increase the mutual understanding and cooperation between the information technology industry and law enforcement agencies around the globe. An exhibition dedicated to government bodies, academia and the private sector will showcase the latest technologies, research findings, solutions and services on information security and incident response.